I colored the snowman and little bird with my ProMarkers, trying something a bit different this time in that I wanted the sun to be shining from behind and slightly to the left of the snowman. For some reason, I tend to put my light source to the direct left or right (or off center to the front left or right) on most of the things I color. I found a scrap of red and white, polka dot, CS, wrapped it with very narrow white ribbon, and then made the bow with the help of my Zutter Bow It All. The card base was pre-printed and the little penguin with the North Pole sign is on the card front, not stamped by me. I die cut and matted my image, then went back and added some snowflakes to the background using a glitter gel pen. Because I wanted the little penguin to show, I adjusted the placement of my image over to the very edge of the card so the penguin not be covered. The sentiment is from QKR Stampede. Great "save" and I love the look of the shadow! Cute image and a fun card. Love that ribbon treatment too. Another GREAT card, good thinking about the shadow, Yes! it looks good. Love the ribbon and the paper. Love how you have adapted the card to suit your need. AND the sentiment is Super. 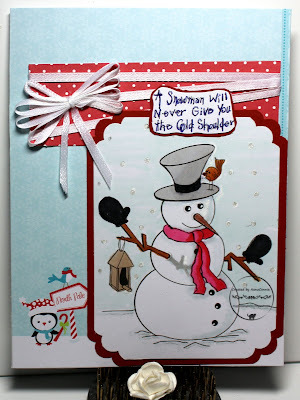 Fabulous, I love the snowman.